Word has reached me that, as of writing this, the results from the most recent sitting of the Ontario Bar exams have come out. While some of my friends were successful, others were not. I’ve spoken before about how to approach the mechanics of studying for the bar (see parts one, two and three of my series); however, I haven’t spoken before about the mental state you need to be in, especially if you’ve just found out you weren’t successful in passing the bar. It is perfectly normal to be frustrated with the process. You feel worried about your competency as a lawyer. You feel that you’ve invested so much time and energy already into overcoming this hurdle. Many articling students feel that, after enduring the grueling process of getting into law school, finishing law school, hustling to find an articling job, etc, that they’re entitled to pass the bar. I’ve found that, at the heart of this sense of entitlement, there is this myth that the bar exams are a simple formality to complete before becoming a licensed lawyer. However, despite what anybody else tells you, the bar exams are far from a formality. It’s a serious step in the licensing process, and completing them will speak volumes about your endurance and skills. Not only that, but it’s the law; and if there’s anybody who is expected to follow the law, it’s a lawyer! So if you’re feeling frustrated, it’s ok to feel that way. You have invested so much time and money and effort into this process already, and you’re still not seeing the result you want – it’s perfectly normal to feel frustrated about that. But make sure your frustration is not because you’ve bought into this idea that the bar exams are a mere formality. 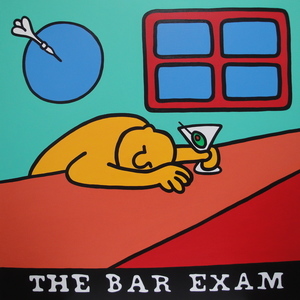 There is a gut reaction that we all face that there must have been a mistake in tabulating the results of the bar exam. The fact is that the bar results are highly vetted and checked for accuracy. The chances of a mistake in the grading process are rare (although not impossible). Be that as it may, one should not rest their hopes of passing the bar on a simple mistake. If you have received the results and you were unsuccessful, take the time to accept those results. It will make the rebuilding process easier once you accept the fact that, despite your best efforts so far, there is still some work to be done to get you where you need to be on this exam. At this point, you should also acknowledge that, despite studying hard, it wasn’t enough to pass. This will help you greatly in assessing your future efforts to re-study for the exam; instead of repeating your past efforts to study, you’ll be better able to assess whether your studying efforts in the past need to be re-examined. It’s been said time and time again that the world’s most brilliant and successful individuals were not initially successful in their endeavours. Lawyers are included on that list too! This fact alone should bring you some comfort, and should prevent you from wallowing in self-pity about this minor hiccup in your career. Ask yourself: do I really want this? There is a reason that this question is at the end of my list. Asking yourself this question while you’re still in the early stages of reacting to your bar results may lead you to give up on the process, even though you might be very close to passing the bar. Giving up on the process when you can still overcome the failure is likely going to lead to a lot of regrets down the road. So, let me re-iterate that this is the last question you need to ask yourself! But if you’re in the right headspace to ask yourself this question, look at things objectively. Try going back to your roots and remember why it is that you pursued a law degree in the first place. Are you enamoured with the idea of being a lawyer? Or does the work genuinely excite you? Do you have a vision of where your career will take you? Is being a licensed lawyer going to help further that career objective? There are a lot of soul-searching questions to ask at this point. These results might be an indication that your career is meant to go in a different direction. It could be a hint that you should use your legal skills in a non-lawyer setting; or it could be an indication that your chances might be better in a different jurisdiction (and think of the opportunities you might find there!). Or it could simply be one of those life lessons that get thrown at us to see how we measure in tough situations. Whatever the case may be, I wish you all the best. I know it’s not easy to be in that situation, where you’re questioning everything and your confidence is at an all-time low. But before you make any decisions about committing to this process, consider whether you’ve given it your best shot yet. If you haven’t, try to identify what’s blocking you from giving it your best shot, and consider giving it another try, in case this turns out to be the career for you. Next Thinking of Applying to Law School? Read This!